Your sports ground should be well maintained to ensure players perform well. In our article on why you should invest in sports ground maintenance, we listed performance of your players as a key benefit. 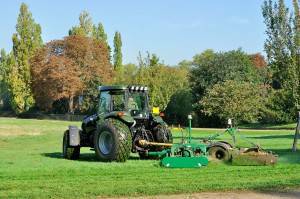 Therefore, it is important that you are knowledgeable when it comes to matters concerning sports ground maintenance. In our last article, we talked about aeration of your sports turf. Today, we shift our attention to verticutting or we commonly refer to as vertical mowing. So what is vertical mowing? Continue reading to find out what it entails and how it helps you. Verticutting is the removal of thatch buildup on the sports turf and is done so that your lawn can breathe easily. Your sports lawn needs good space to breathe and ensure it is absorbing the nutrients that are required for proper growth. Also, it is important to ensure the lawn can soak in the much-needed moisture so that the roots are wet to encourage growth. At this juncture, you are likely to ask yourself what we mean by thatch. What is Thatch and How does it affect your sports turf? Thatch is the layer of dead stems and roots which will form between the grass and the soil. Whereas it is not as bad, getting rid of these dead stems and roots is important to ensure the health of sports turf. Consider that if not removed, thatch will accumulate on the sports ground. When this does, it reaches a level where it starts eating up the nutrients that are good for the turf. This means that the turf will not get a good supply of air, water, and nutrients. Also, consider that insects will hide in thatch and it is also likely to cause diseases in your turf. Another question that you might like to have an answer for is how will you know that your turf as thatch? The answer is pretty simple. Just walk over your sports turf, and if you feel some sponginess, this is a straight sign that you need to carry out verticutting to remove this thatch. So how do you get rid of thatch? You can get rid of thatch using a rake, but this is not the best approach. It is also labor intensive and not practical in a sports ground. Therefore, you need services of a specialist to do the verticutting. Through verticutting, a blade cuts down through to the thatch and doesn’t damage the healthy sports turf. Through this process, the dead layer is brought to the surface and therefore it becomes easy to collect the thatch. Then after verticutting, you might consider doing aeration so that your sports turf will get more air, water, and nutrients. Verticutting should be performed by professionals. This is because you need commercial equipment and it ensures your lawn gets a good aeration which occurs in the process. Would you like to hire a professional to do sports turf verticutting today? Contact us to book for the service.